Sam Holmes travelled more than 13,000 kilometres for a wine festival that will celebrate Canadian wines on a scale that has never been seen before. Holmes is the general manager of Yalumba, the oldest family-owned winery in Australia, and arrived for the 39th annual Vancouver International Wine Festival to showcase some of his property's vintages. But he will also be tasting many Canadian wines -- from British Columbia to Nova Scotia. If you've wondered how the Canadian wine industry has evolved, the 2017 Vancouver Wine Fest promises to reveal the breadth and depth of a viticulture scene that is surprisingly diverse and increasingly important. For Holmes, the past two decades have marked a stark change in perception for the nation's wine culture. "Twenty years ago if you asked a world-class wine maker, 'Why don't you move to Canada and start a winery or work for a winery?,' they would've said, 'What for? That's not going to advance my career.' Now, you ask them if they want to move to the Okanagan Valley and be part of what's happening there, and they would say for sure. Now, the response you get is, 'Why wouldn't you?'" says Holmes, whose company has been attending the wine festival for about 15 years. 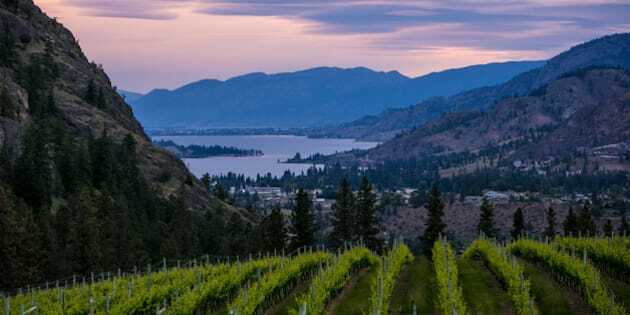 The Okanagan Valley, which has 330 wineries (about 100 more than the Barossa Valley), is the premier wine region in Canada and will be showcased during the festival. Like many Australian winemakers, Holmes has come to respect Canada's grape-growing industry and he says that slowly the wine consumer Down Under is beginning to realize there's excellent food and drink to be had in regions of North America outside of California. "Canadian wine is probably still a little unknown in Australia. We know icewine, of course," Holmes says. "But Australians are coming to Whistler and coming to Banff to ski and enjoy the outdoors, and so they're also getting to try the wines. They're discovering the white wines and the good red wines of Canada. So it's starting to get recognized by the consumer." This year's Vancouver Wine Fest includes the largest collection of Canadian wines and winemakers at any international wine show. The celebration marks the nation's 150th anniversary, making the timing ideal for such a gathering, says Harry Hertscheg, the executive director of the festival. More than 1,700 wines will be poured during the festival, which launched Saturday night at the Fairmont Hotel Vancouver with the annual Bacchanalia Gala. Before the event closes on February 19, 54 events will have taken place, providing several opportunities for unique and romantic dining experiences during the course of celebrations on and around Valentine's Day. The wine festival features wine-focused dinners at some of the city's top restaurants and a massive tasting room at the Vancouver Convention Centre. Yet, as Hertscheg says, pulling the nation's different regions together for the festival wasn't an easy feat. "We do a good job with trade with other countries but we don't always do that with each other," he says, noting the hope is to have more availability of Canadian wines across all provinces. "We will see if Ontario and Nova Scotia wines will be selling here in B.C. someday soon. We hope that's the case." For chocolate lovers, there may be no better place to find satisfaction than Wild Sweets, a bean-to-bar chocolate maker in Richmond. Located in a storefront in an industrial park about 20 minutes by car from downtown Vancouver, Wild Sweets may be the most under-the-radar foodie gem in British Columbia. Owned and operated by Belgian-born Dominique Duby and his wife, Cindy, Wild Sweets has won international acclaim for its excellence. They've produced five cookbooks and their products are available in retail stores such as Whole Foods. Recently, they began to offer an in-store tasting experience that is an education as well as an indulgence. "The bean-to-bar process is about passion," says Dominique Duby. "It's very similar to people who make wine. They have the passion to make as good a product as they can, and it is the same with us." Duby, whose father was a chemical engineer, studied physical and chemical engineer before deciding he wanted to enter the culinary world because "I wanted to travel." His goal for his customers is to deliver a "brain-based" experience. "The hope is to make you have an emotional connection to what you are eating," he says. The emotion you will feel during the tasting experience, which lasts two hours and includes about 40 samples, is joy. You'll taste the raw cocoa beans from Peru, Mexico and Venezuela, as well as chocolate at various points during the creation process. There's also chocolate tea, brewed with the husks of the cocoa bean, and hot chocolate varieties to sip. Thomas Haas (2539 W Broadway, Vancouver) -- Similar to the Dubys' experience, Haas and his wife pursued a life as chocolatiers that began in Europe. Along with its decadent, award-winning chocolates, the cafe run by the German-born Haas features pastries, croissants and other treats to savour. Beta 5 (413 Industrial Avenue, Vancouver) -- If you like your chocolates to go, Beta 5 is a tempting choice with cream puffs, caramels, bars and gift boxes. It's products have won rave reviews from consumers and critics.